Motherhood is embedded with decades of tradition. One mother may tell another a variation on one practice or another, but there are some baby-rearing facts that are passed down for generations. From muslin swaddling cloths to sleeping bags to cot sheets, Aden + Anais' range of baby goods are based on the family traditions that founder Raegan Moya-Jones brought with her from Australia to the US. Aden + Anais focus on products developed for your baby, but designed for you. And if Raegan knows anything, it’s the valuable role of muslin cotton in your baby’s everyday life. This Cot Sheet is super-stylish while being wonderfully soft, comfortable and breathable. It will also soften with each wash, while an elasticised fit provides a snug fit around cot mattresses. To top it all off, the sheet’s muslin cotton weave has the added bonus of being warm in winter and cool in summer. With a sweet array of prints to choose from, all you need to do is find the style that suits your baby’s nursery best. Made from luxuriously soft muslin cotton. Elasticised fit will wrap around cot mattresses snugly. 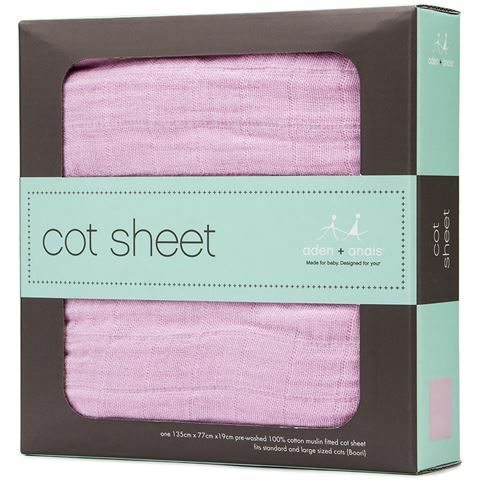 Fabric softens with each wash, and remains comfortable on baby's skin. Presented in an Aden + Anais gift box. Cold machine wash before tumble drying on low heat. Dimensions: 135 x 77 x 19cm.